Welcome to Joy Lane Farm! 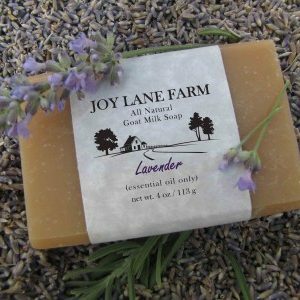 We specialize in handcrafted goat milk soaps, soy candles, lotions, and lip balms. Our super moisturizing soaps and lotions are rich in vitamin A and other nutrients, which make them excellent for dry skin. We use natural ingredients and source locally whenever possible. If you're interested in carrying our products, we would love to partner with you. Email us for more info. Thank you! 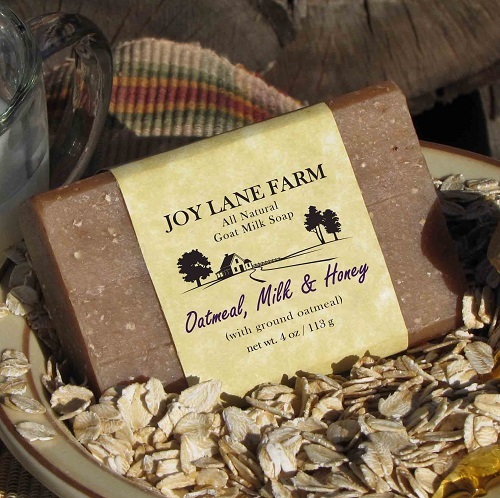 At Joy Lane Farm, we breathe a simple mantra: Live joyfully, do great things, celebrate family. That’s the feeling we build into all our products. We work hard to find ingredients that are good for you, delightful to use, and sourced with integrity. 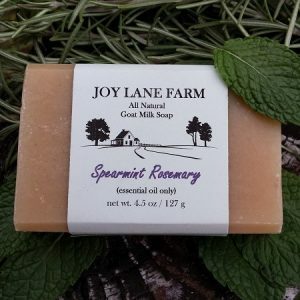 Take our goat milk soap: It’s chalk-full of vitamins and nutrients that moisturize your skin, has a creamy, luxurious lather, and the goat milk is sourced from local farms. At every step in the process, from the casually elegant, environmentally friendly paper that wraps it, to the third-generation family company where we buy our olive oil, our goat milk soap is made to give you pause; we want you to savor it—to live joyfully. We believe living joyfully is inseparably connected to doing great things—pouring our lives into our communities and world because we are grateful for the goodness around us. Put more simply, gratitude begets generosity. We practice this every way we can, but we’ll describe two ways here. As a baseline, every month we give 1% of our projected sales to Mercy Ships, an organization that brings modern healthcare to impoverished people in Africa. We don’t think money can solve everything, but there are some things, like tumors the size of footballs, money can solve. Our we-choose-to-go-to-the-moon goal is to annually pay the full living expenses of a nurse working on Mercy Ships by 2027. Closer to home, we are building Joy Lane Farm to eventually provide manufacturing jobs. Manufacturing jobs, as well as being a driving force in the economy, are vital to low income families because they provide a solid wage that doesn’t require a college degree. A well-paying manufacturing job can change a family for generations. That brings us to the last part of our mantra: Celebrate family. Before Joy Lane Farm was ours, it was the name of Joel’s childhood homestead. His mom loved animals and started making soap with their extra goat milk. When his parents moved to Africa to work with Mercy Ships, we took on Joy Lane Farm. Our aim to live joyfully and do great things comes from our families; building Joy Lane Farm is our way of celebrating their legacy. Celebrating family is also an outlook on life. One of our traditions is opening a bottle of champagne for major milestones. It’s impossible not to be happy when you hear the pop of a champagne cork. We’ve started labeling the corks and keeping them. By weaving our family stories into Joy Lane Farm, we hope you’re encouraged as you celebrate your own family. Young or old, the worth of a thriving family is beyond estimation.